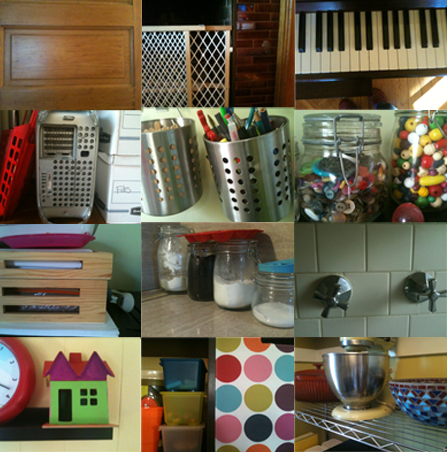 Inspired by our Tana Hoban books The Bee and I recently went on a hunt through our house, searching for shapes. We started with our floor which is squares, and before we knew it we were finding shapes everywhere. The Bee did the shape finding and I did the picture taking. The Bean joined the trek, although she didn't quite understand what all the commotion was about, she liked wandering around the house. 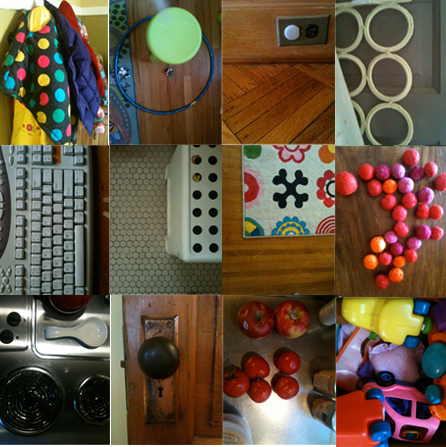 The whole adventure lasted probably 20 minutes but in that time we took 32 photos of circles, squares, rectangles, ovals and diamonds in our house. I took all the photos and put them together in a book. I was going to just print it on the computer but I had a good coupon code to Shutterfly and was ordering some other photos so I just let them do all the work. A week and a half later and we received our very own shape book, filled with our very own photos of shapes from our very own house!